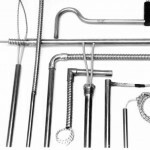 Band and Cartridge Heaters | De-Mar Inc. Distributor of Chromalox, Rama Heater and EZ Heat band heaters. Mica band and strip heaters supplied for industrial and plastic applications. 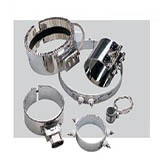 Mica band heaters used primarily in plastic barrel and nozzle heater applications. All voltages available: 120, 220, and 240 VAC. Single phase and three phase wiring. Wattage dependent on recommended watt density per square inch. All diameters and widths of heaters available. 2-Piece design typically used in diameters over 14 ½”. 1-Piece bendable heaters also available for large diameter applications. Rectangular heaters and strip heaters also available. All styles of leads available: fiberglass sleeve, metal braid covered, stainless steel conduit, post terminals, OEM plugs and jacks, and terminal box covers. Holes, notches, cut-outs, and thermocouple adapter connections are available. 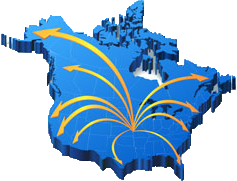 Ability to duplicate OEM heaters to save on cost and accelerate delivery time. Special sizes and configurations – no problem! Nozzle band heaters stock in Overland Park, KS and Horseshoe Bay, TX! Any configuration of band heater can be manufactured to ship in 1 to 2 days with expedited delivery! Distributor of Rama Heater, EZ Heat, Chromalox and Dalton cartridge heaters. Cartridge heaters supplied for industrial, thermoforming, and plastic applications. All voltages available: 120, 220, and 240 VAC. Single phase and three phase wiring. Wattage dependent on recommended watt density per square inch. Diameters available in: ¼”, ⅜”, ½”, ⅝”, and ¾”. Metric diameters available in: 6.5mm, 8mm, 10mm,12mm, 12.5mm, 15mm, 16mm, and 20mm. All lengths available. 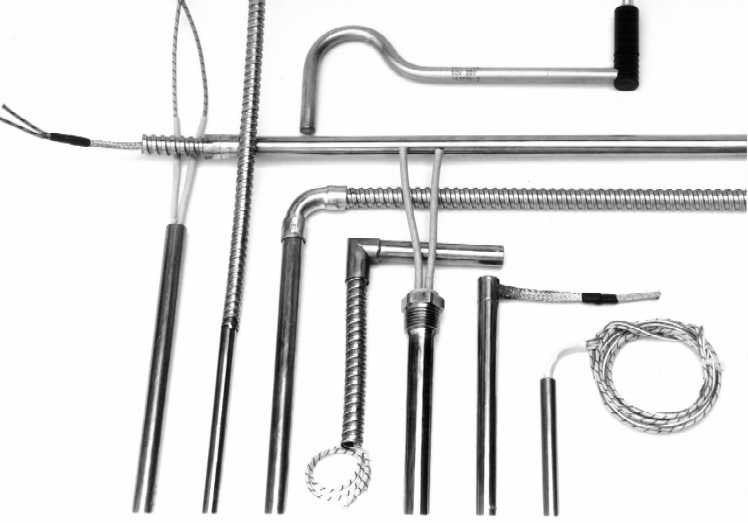 All styles of leads available: fiberglass sleeve, metal braid covered, stainless steel conduit, internal thermocouples, right angle leadwires, and flexible conduit with 90 degree elbow. High temperature Incoloy sheath options available. Split-sheath design to prevent long cartridge heaters from warping and seizing up in the bore. Any configuration of cartridge heater can be manufactured to ship in 1 to 2 days with expedited delivery! Distributor of Chromalox strip and ring heaters. Strip and ring heaters supplied for industrial, thermoforming, paper mill, and plastic applications. All voltages available for strip heaters: 120, 220, 240, and 480 VAC. Single phase and three phase wiring. Maximum sheath temperature 1,500 ̊F and watt density: up to 38 W/in.^2. Rugged and easy to install, these units transfer heat by either conduction or convection to heat liquids, air, gases, and surfaces. For drying, melting, baking, or curing. 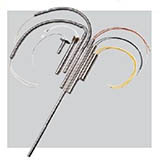 Strip heaters range from 0.5″ to 2.5″ wide and lengths to 72″. Units bolt or clamp with many surfaces. Ring heaters can be nested to provide concentrated heat in a small area. 120 and 240 VAC available 125 to 1,800 Watts. Diameters supplied in 2.5″ to 11″. All styles of leads available: fiberglass sleeve, metal braid covered, staggered posts and post terminals. Mounting tabs and holes can be specified. 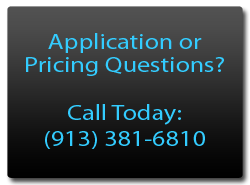 Call or email today to get a competitive quote on strip or ring heaters! Tubular heaters, coiled nozzle heaters, cast heaters, and silicone rubber flex heaters also available. 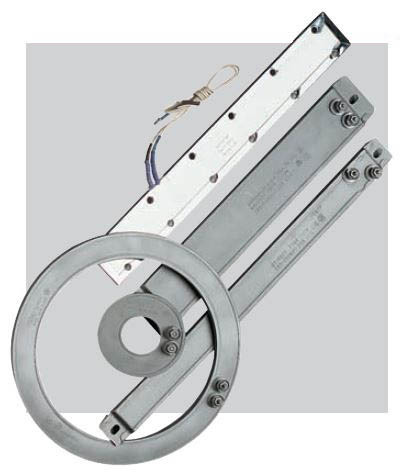 Tubular, immersion, screw-in, and flanged heaters available. Tubular heaters straight or bent to customer specifications. Precision shapes with engineered drawings. All styles of connection and terminations available. Coiled nozzle heaters designed for maximum performance in sprue bushing applications. 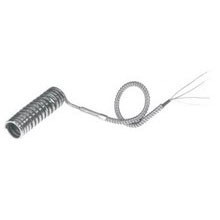 Industry standard coils with integrated thermocouples in leads. Profiled heat available. Ability to cross DME part numbers and all other manufacturers. Coiled nozzle heaters stock in Overland Park, KS and at factory! Cast-in aluminum and cast-in bronze heaters available in all configurations! 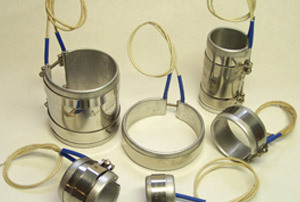 L-shaped, ring style, fin cooled, cooling tubes, and all clamping and connection styles. 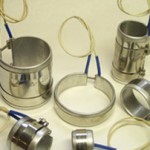 Ability to supply replacement cast-in heaters for all manufacturers and plastic OEMs. Silicone rubber flex heaters available in a variety of shapes and ideal for industrial applications with limited space. One of the most durable and flexible heaters on the market. Sheath is fiberglass reinforced Silicone rubber and fully vulcanized to provide a tear resistant blanket heater. Available with integrated thermostat, all styles of lead configurations, dual voltage and three phase designs are available. Contact De-Mar & Associates for all your heater needs!